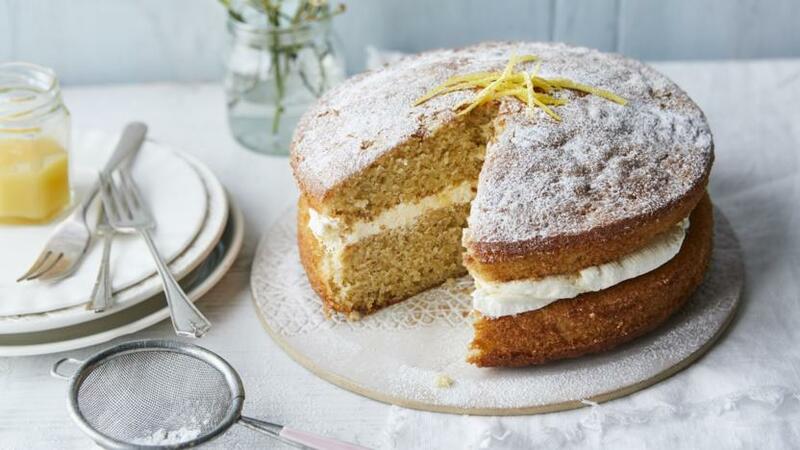 Mary Berry's ultimate cream sponge cake – the apple makes the cake really moist and the lemon-flavoured cream keeps it fresh-tasting. Delicious! You will need two 20cm/8in round, loose-bottomed sandwich tins and an electric hand whisk. Preheat the oven to 180C/160C Fan/Gas 4. Grease two 20cm/8in round, loose-bottomed sandwich tins and line the bases with baking paper. Measure all the sponge ingredients except the apple and icing sugar into a large bowl and beat with an electric hand whisk until combined. Fold the grated apple into the mixture, then divide between the tins and level the tops. Bake in the oven for about 25–30 minutes until golden, well risen and coming away from the sides of the tins. Allow to cool in the tins. Meanwhile, make the filling. Whip the cream into soft peaks in a bowl, then lightly swirl in the lemon curd. Invert the tins to remove the cakes and then peel away the paper. Sit one cake upside down on a serving plate. Spread the lemon cream to the edge of the sponge, place the other cake gently on top to sandwich the cakes together. Dust the top with icing sugar to serve. For a speedy way to grate the apple, first core the apple and cut into pieces but keep the skin on. Grate the flesh and then discard the skin. Once assembled, keep the cake in the fridge for up to one day, but serve at room temperature. The cooked sponges also freeze well.